The Amish Made Outdoor Poly English Garden Bench looks amazing in the backyard as a single piece, but the versatility of this piece allow it to act as an accent piece for the rest of your outdoor furniture. Comfortably seat two people in this poly garden bench and choose from our wide selection of poly colors to ensure it matches the rest of your outdoor decor. Add to the comfort of this bench by adding a bench cushion to your order! Please call with questions on this beautiful Amish outdoor bench and our other Amish made outdoor furniture items. 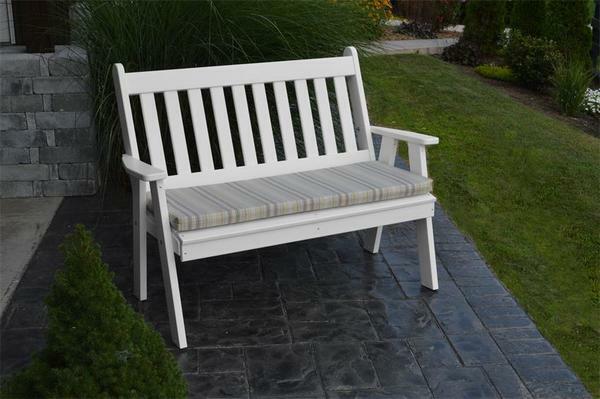 This bench is perfect for the garden, front porch or patio. It is handcrafted from maintenance free and environmentally friendly poly which comes in a variety of color options.